Super Typhoon Yutu, 'Strongest Storm Of 2018,' Slams U.S. Pacific Territory Tens of thousands of U.S. citizens in the Northern Mariana Islands got lashed with winds of Category 5 intensity. The storm's vast scale and rapid escalation stunned meteorologists. Super Typhoon Yutu, seen in infrared satellite imagery. See those white outlines at the heart of Yutu's red buzz-saw-like shape? Those are the Northern Mariana Islands. diminish through the day," the service said. 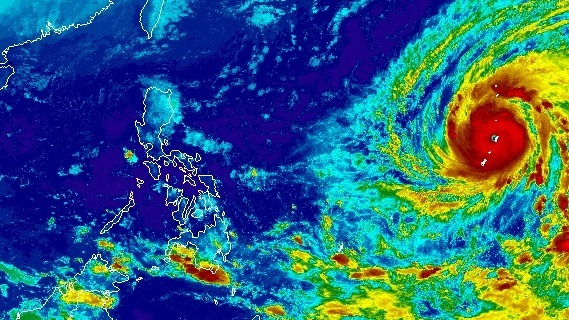 The tone of the latest update was significantly more subdued than the one sent as Yutu prepared to make landfall. "Catastrophic winds for Tinian and Saipan are imminent!" officials said. "Super Typhoon Yutu is a very dangerous Category 5 storm!" Meteorologists described the storm as not only "Earth's strongest storm of 2018" but also "one of the most intense hurricane strikes on record for the United States and its territories." The more than 50,000 people who live in the Commonwealth of the Northern Mariana Islands faced a storm surge of up to 20 feet and rainfall of up to 10 inches in certain areas. Michael Ziobro, a meteorologist with the National Weather Service in Guam, told NPR that instruments on Saipan and Tinian "gave out" after recording winds of about 104 mph. And just listen to the unsettling wails of the wind recorded by a camera on Saipan. The island, together with Tinian, stood in the path of Yutu's eye. "We saw photos, images of destruction from their airport and two other facilities, and just debris strewn about everywhere across that island," Nick Delgado, a reporter at KUAM News in Guam, south of Tinian, told NPR. "So we know that the Coast Guard and other local government officials are working to get things back up and running there, but at this point it's just all hands on deck to get these islands back to normal," Delgado said. The typhoon's intensity escalated at an "unbelievable" pace prior to hitting the islands, according to meteorologist Steve Bowen, just two weeks after Hurricane Michael's intensification in the Gulf of Mexico stunned meteorologists, too. "As the storm starts to rapidly intensify, it takes on this buzz-saw-like shape. It becomes very well-defined," Angela Fritz of The Washington Post's Capital Weather Gang told NPR earlier this month, referring to Michael's surprising escalation. "You have this sinking feeling that things are about to get much worse than the forecast had suggested." Please stop for a few seconds whatever you are doing and think of the people on the Northern Mariana Islands. "Devastating damage is expected. Collapse of some residential structures will put lives at risk. Airborne debris will cause extensive damage," the service warned. "Persons ... pets ... and livestock struck by the wind-blown debris will be injured or killed." In a previous version of this story, we incorrectly said meteorologist Bob Henson had characterized the escalation of the typhoon as unbelievable. That characterization actually came from meteorologist Steve Bowen, whom Henson was retweeting.